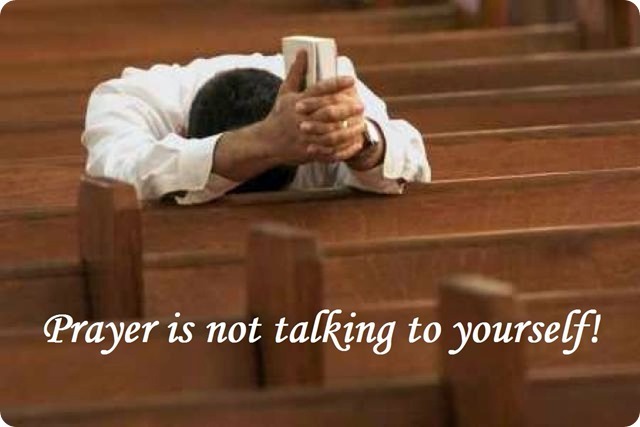 In spite of what you may sometimes think – Prayer is not talking to yourself! PRAYER IS BEING WITH GOD! “No, because I’ve never heard it before,” the man answered. “Don’t you mean you’ve never listened to me before?” the voice responded. “Hearing is the difference. Sounds entering ones ear does not constitute hearing. ” the voice answered. “Wow! I never knew,” the man answered in surprise. It is nearly impossible to talk and listen at the same time! When we pray sometimes we talk – sometimes we need to stop – look – listen.